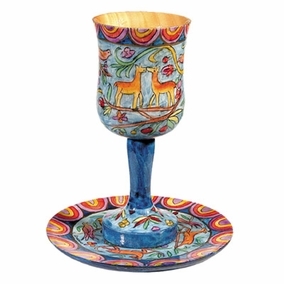 Kidush Cup and Plate Set CAT# CU- 2. Each cup and plate is hand – painted with a brush using acrylic colors and then lacquered. The cup can be used for drinking and also be washed by hand in water since it is coated with several layers of lacquer. Size: 5.7” X 4.5”. .Since the Shabbat morning kiddush is rabbinically rather than biblically mandated, it has a lesser status than the Friday night kiddush. In order to elevate its importance, it is euphemistically referred to as "Kiddusha Rabba"—"The Great Kiddush." There are different versions for the kiddush on Sabbath morning, and it is generally shorter than the Friday night kiddush. Originally, this kiddush consisted only of the blessing over the wine.